Spending your holidays in the Golfo di Orosei is an experience you can truly savour from your base at Camping Cala Ginepro. The Golfo di Orosei is utterly unique, and includes bays of world-class beauty, which can be easily reached on boat trips. From Orosei, just 12 km away from the campsite, there are various companies offering excursions by boat to the inlets of the Golfo di Orosei. You can thus gaze in wonder at the evocative, cliff-filled coastline and lose yourself in the turquoise and emerald-green shades of the crystalline water, safe in the knowledge that your guide is firmly in charge of everything involved in your visit to the Golfo. The staff at the Reception desk of Camping Cala Ginepro will be delighted to provide you with all of the information your require to make the most of your holidays in the Golfo di Orosei, working in partnership with the local tour operators. On boat trips in the Golfo di Orosei, the limestone cliffs will enchant you with their majestic forms. 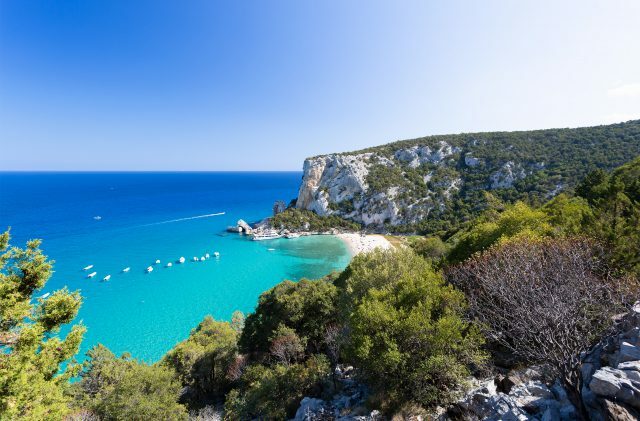 Against a breathtaking backdrop, typical of eastern Sardinia, you will see the famed Cala Luna (“Moon Bay”), a tourist hotspot and favourite location of film directors. We will also visit Cala Sisine, Cala Biriola, Cala Mariolu and the Piscine di Venere…Only reachable by boat, the so-called “Pools of Venus” in the Golfo di Orosei stand out for the mind-blowing shades of blue of the water. The privilege of a dive into the Piscine di Venere should not be missed! In the Golfo di Orosei, standing out against Cala Goloritzè, the pinnacle of the Aguglia di Goloritzè is located along a coastline that falls within the Baunei area. The sides of the Aguglia di Goloritzè are specially equipped for climbing, which on this tectonic tower is necessarily a technical endeavour. The limestone of the monolith, with its grey undertones, is similar to the Verdon gorge in France, and affords the opportunity for an evocative climb in stunning surroundings. At 143 metres high, the Aguglia di Goloritzè is a unique spectacle in the middle of the sea! Capo Monte Santo, which can be seen from Camping Cala Ginepro on Sa Mattanosa beach, marks the southern limit of the Golfo di Orosei. Orosei, its beaches and its gulf will offer you unforgettable vistas, made all the more interesting by the contrasts between the rough rocks covered in Mediterranean maquis and the crystal-clear transparency of the sea. And when evening comes, after a trip round the bays of the Gulf of Orosei, you can return home to the campsite, with all of the amenities you could wish for, in the untainted natural paradise that is Cala Ginepro.